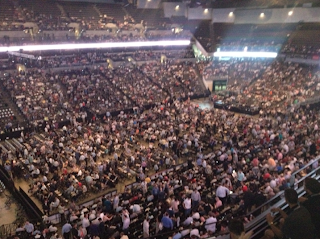 My Take: Berkshire Hathaway Shareholder Meeting, Woodstock for Capitalists. Just before six a.m. our hotel van delivered us to the CenturyLink Center in Omaha. As we joined a long line of attendees and others, I was reminded that this journey started much, much earlier... at age 11 to be exact. As a pre-teen there were no bedroom posters or trading cards to express my passion for making money. I watched Alex P. Keaton and Gordon Gecko but neither seemed like ideal role models. Even then I recognized Trump's value more as a promoter than his ability to genuinely make a difference. If I was going to worship someone’s business acumen, I wanted him to be able to change the world (not just name things after themselves). After reading the Making of an American Capitalist by Roger Lowenstein in the fall of 1995 I had a new deity – Warren E. Buffett. Hook. Line. Sinker. And I was his perfect disciple. Delayed gratification? Check. Sacrificing now for future gains later? Check. Buy for value? Check. Hold for the long term? Sign me up. Granted, I was in my early 20s and if I was ever "flush with cash" it was merely for a few moments on Friday afternoons. Come to think of it, I probably only knew one or two people who were actually worth ‘four figures’! No matter, I had big plans for myself and decided to accept Mr. Buffett as my personal mentor of capitalism and wealth creation. It became somewhat of a one-sided relationship but I didn’t mind. Fast forward almost 20 years and I found myself at the Super Bowl, Kentucky Derby and the Daytona 500 all rolled into the Annual Berkshire Hathaway Meeting. I was overwhelmed. There is truly no place I'd rather be and apparently I was not alone. I was accompanied by 40,000 other fans – all “pulling for the same driver." "Good thing we got here early..."
The doors didn’t open until 7 a.m. so I passed the time talking with the folks around me. I say folks because even though we may not have looked alike there was a distinct familiarity. We were comfortable around one another because we all knew that we shared at least one common interest in the Oracle of Omaha. I met a woman in her late 50s who had driven up from Lincoln the day before with her 80-year old parents. "We do this about every year, I think it's our 10th or 11th meeting." The 70-year old divorcee from San Clemente was especially interesting. Her father had given her Berkshire stock in the 1970s but during her divorce some 20 years ago her dad insisted that she give her ex "anything he wanted but don't let him touch that stock." To say the place was electrified would be an understatement. Between the sounds of Bach and Jack Johnson I watched the arena fill. 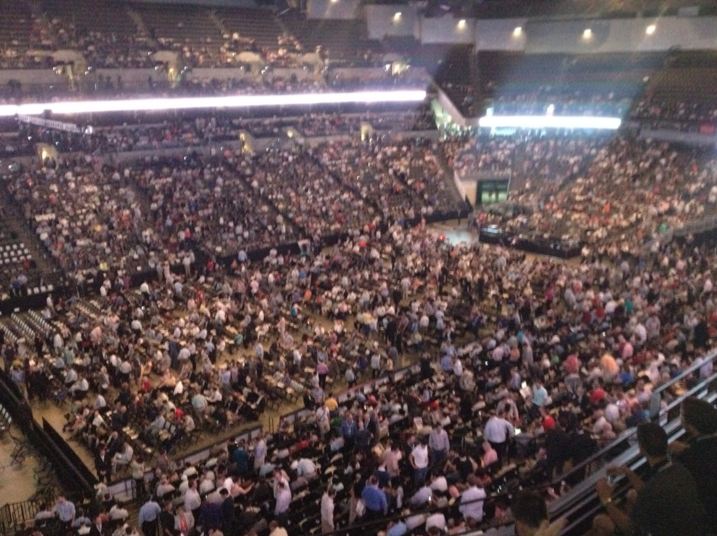 As I surveyed the predominantly older crowd as they took their seats I was reminded, that this is not some "Omaha Social Event" or a stereotypical crowd of Wall Street Brokers. These "attendees" were the part owners of a very large corporation and Warren Buffet was their trustee. He was one of them. They identified with his ideals and more importantly, they relied on him to continue protecting their sense of financial security. More obviously, these weren't people who had invested in a sole company, they had invested in sole person. The lights dimmed and the movie started at exactly 8:30. A brief video intro from Buffet requested we refrain from recording the pending movies, even encouraging the audience to ask their neighbors to do the same. Instinctively the entire arena looked around– everyone took the request seriously because no one was going to let Warren down. What followed was a roller coaster of cartoons featuring Warren and GEICO commercials with Charlie Munger. Parodies, video skits and shameless product placement were followed by nostalgic news clips from the early days in a downtown Omaha theater bursting with 1500 attendees. The videos were low budget but the topics were current and entertaining. The audience favorite was easily the clip of Warren in his wood paneled office seated at his overloaded desk doing a very poor job of answering the company phones. His longtime secretary, Debbie, (with feet propped on her desk and primping in front of a makeup mirror) couldn't be bothered. After her quick rise in media fame due to the fact that she paid a higher percentage of her income in taxes than her boss, she was busy taking calls from Oprah, Vanity Fair, even the POTUS. Rolling her eyes and making the universal "gag me" sign when Warren tried to get her attention from the adjacent office had the crowd roaring with laughter. The movies ended, stage lights came up and through the center of the blue curtain Warren and Charlie Munger entered the stage. The arena was jubilant and I found myself grinning uncontrollably. Taking their seats at a 6-foot table draped in black, Buffet and Munger were side-by-side and looked like Randolph and Mortimer from the movie Trading Places. As they spoke this was anything but a joke. At 81 and 88 they immediately took command of the proceedings. It became all business as the meeting rules were laid out. Over the course of five hours, with a lunch break, Warren and Charlie answered about 60 questions. I can only liken this experience to listening to my very favorite band play to a sold-out concert, but instead of playing from their newest album we enjoyed the audience requests. It was fascinating. As expected, one of the first questions was regarding Warren’s health. Candid as always, he reassured a somewhat tense audience that he was more likely to get shot by a jealous husband than get taken out by prostate cancer. Munger quipped that Warren gets all of the attention and that he too probably has prostate cancer but won't let the doctor touch him “there”... Again, the crowd roared with applause and laughter. Their table started out neatly organized with two ice buckets filled with Cherry Cokes for Warren and Diet Cokes for Charlie. They took turns working through the See’s Candy (fudge and peanut brittle) and a cooler full of Dilly Bars. We couldn’t help but snicker everytime Charlie cracked open another can of Diet Coke: Heard through his mic and resonating through the arena the way a beer can sounds in a quiet movie theater. I knew very little about Charlie before the event. He is obviously brilliant and was very much a crowd pleaser because of his no nonsense replies, quick one liners and the equal opportunity with which he offended everyone from politicians and attorneys to fund managers and ivy league schools. Munger consistently replied with, “you've covered it” or a simple five-word phrase that perfectly summed up Warren’s longer explanation. Warren told us that he "sleeps well" with $20 billion in the bank but he's itching for a deal. When asked about his successor he reassured a pensive crowd that his replacement would be much better than he. He followed with heaps of praise on his current managers. Restating that they are the best, from their culture to compensation and incentives, he trusts his team and they will always be the reason for Berkshire’s success. Questions that I found most compelling included the argument that his vocal comments regarding taxation and the “Buffet Rule” were bad for Berkshire's brand. “Where does it say that my citizenship has to be in a blind trust?” Buffett replied. “For the past 47 years you'd be better off selling 2 percent of your stock instead of taking a dividend; we’ve done the math, we make much, much, more by continuing to invest that cash. Maybe this just isn't the right stock for you. Next question?" As our 3:30 p.m. cut off neared I could see why the meetings have grown more each year. What started as a "one time thing" for me could easily become something of a routine as I make a note of the 2013 Annual meeting and start planning the next trip in my head. Munger and Buffett know they aren't going to live forever and so do I. After seeing these two interact I recognize that the annual meetings won’t be the same with one and not the other. While I plan to attend another meeting I don't know when. Fortunately with all great adventures, the memory will forever be vivid and an experience I plan to share for a long, long time. - Hotels near the the Century Link Center and Downtown Omaha can get expensive. Consider Council Bluffs, Iowa. Directly across the river from Omaha with rates under $100/ night in some cases. - Feeling lucky? Council Bluffs has a number of Casinos including Harrahs, Ameristar and Horseshoe. - Transportation was a breeze with the hotel courtesy vans. Nothing was more than a 10 minute drive, including the airport. Early morning shuttles to the Century Link center the morning of the event start leaving the hotel at 5am. - Flying? Book early or consider leaving on the first flight out of Omaha Sunday morning and save at least $100. - Downtown Omaha. Better than you think. Great Downtown districts with many open air seating, live music and a diverse set of restaurants and interesting shops. - Your Berkshire hosts provide a ‘visitors guide’ with specials, deals and an agenda for all of the pre and post meeting events. Additionally, the ‘entire’ City will welcome you with open arms – they are proud to be the world headquarters of this iconic firm. A Little Older, A Lot Wiser. The following article was published in the Greater Wilmington Business Journal on October 14, 2011. At some point you become 40. At this stage in life, sensible people focus on their own successes, their triumphs, their good fortunes and even their near misses..
For some, however, it can be the time to wallow in the wake of your failures. After all, you're only as good as your last mistake. It’s easy to place blame on those who let you down, pulled the rug out, took a stick to your knee caps - or even the currently popular "difficult economic situation." Regardless of how it all happened, the blame still comes down to you. And that's when the 'what ifs" really start to roll. You backtrack every decision over and over again in your head. You’re intelligent, hardworking, and well intentioned yet you’ve created enough collateral damage to last a lifetime of careers. So where exactly did you go wrong? On an early Saturday morning in spring 2005, you're sitting in an attorney’s oversized conference room negotiating the biggest development deal of your life. You drive home that afternoon, slapping the steering wheel and singing with the radio, aloud and proud, oblivious to the challenges that lie ahead. Within a matter of hours the gravity of the project sets in and you press forward in the execution of your flawless plan. You assemble the best team. Your cash flow is strong, so you don't spare a dime. You create impeccable talking points. You anticipate every problem. You actually write down worst case scenarios and delegate a defensive team to deploy preemptive strikes. Now that you have a plan, you take it to the bank. The local guys love the deal but their nameless credit folks aren't too keen on a $15 million acquisition and development loan - especially one with only a few dollars for the down payment. "Look at the demand and our track record," you argue. "We can TOTALLY do this." "No. You need to find an equity partner." "What kind of an equity partner?" It's the spring of 2006. More than a year has passed and like everything else that comes with time, you’ve formed an emotional attachment to your vision for the project. Your closing date with the seller is pending. You don't want a bunch of partners screwing up your vision, but you start to contemplate the banker’s notion. Some guys call you back. They've been in town a few years. You've driven by their deals, they seem real and they want to meet. You're flattered. They tell you how much cash they have available, and that they are practically "oversubscribed" with investors. It gets better. For that year or so you worked so hard getting to this point, they’re going to give you a mind blowing $3 million dollars AND let you stay on as a 5 percent partner for the inevitable upside. No matter that the $3 million would be paid later, as soon as the deal was sold out, and after the bank was paid off. A new LLC is formed. Six great guys including you are embarking on an incredible adventure. Within a few months you're signing some loan docs 'jointly and severally.' The land sellers get their payoff and you practically break your arm patting yourself on the back. The partners gather with their spouses at a steakhouse near the beach to celebrate their genius. You raise a glass, exhale and breathe easier. Its fall 2006, and the hard part is out of the way. You're ready to get to work. Your focus shifts back to marketing mode. It's what you do best. You travel the region looking at the best projects, the coolest buildings and the most talented architects. While dirt is getting pushed around the site, you're anxious to get started on the marina, an elaborate trophy that will have your prospective buyers drooling. This has become more than a vanity project; this is your professional swan song. Not only will this likely be the last significant endeavor of your career, it will be your legacy. Then something unexpected happens… something that wasn't on your worst case scenario list. It's the Summer of 2007 and you're notified that all infrastructure work must stop. Despite being at least a year away from the flush of a toilet, and your site abuts an underutilized lift station, a sewer moratorium affects all building projects in the city - even those nowhere near the problem. Meanwhile, the interest reserve the bank lent you is dwindling, but it's OK, because your 5 percent share of the ominous $50K interest payments is a manageable $2,500 a month. Good thing all you have to do is focus on selling condos and not dealing with the periphery. About this time you get a call from your old friend at the bank. - "We need to talk". Interest payments haven’t been getting made, the project has slowed to a crawl, and you’re still at least a year before you can even start your first building. That’s when you realize the reason you aren't receiving monthly cash calls for your $2500 share of the interest payments - your partners don't ask for your 5 percent share because they can't pay their substantially larger portion. Despite the stock market’s slow but steady decline from its October 2007 highs, you make a split-second decision to reallocate some of your personal savings to pay off the other partners and get them out of the way. You've gone from being a 5 percent partner in the project to a 95 percent owner. Work begins again on the site and it's only a matter of months before you'll be going vertical. It's now March 2008. You've invested hundreds of thousands of your own dollars into architectural plans, engineered drawings, and marketing materials. Your excitement to begin construction is overwhelming. The economy seems to have stalled somewhat but you read an article that the market would rebound by the fourth quarter and you congratulate yourself on your timing. Instead of patting yourself on the back this time, you roll up your sleeves. You need more momentum. You cut a deal with the city and the RiverWalk gets built. Activity breeds activity you say to yourself. You set your sights on getting that first building started. Fall of 2008. This time it's not a phone conversation but a meeting at the banks conference room. Your main guy is there and he looks pale. There's another guy in the room. You meet him for the first time, not sure of his role. He's older, from out of town, and he tells you he’s just there to help the bank out. Since you haven't missed an interest payment and the project is progressing (albeit slowly) you really see this as more of a "general update" meeting. But it's not that kind of meeting. You learn a new word that day from the “out of town” guy. It's called "curtailment". You don't need to ask the meaning, as the one sided conversation carries long enough for you to realize that the lender is no longer going to advance funds from your original loan in order to complete your project. That's not the bad part. The bad part is when he tells you that falling real estate values and new government mandates require you to transfer a significant amount of your personal brokerage account funds toward your loan principal balance. Your safety net of available cash is an attractive opportunity for the bank. In an instant your liquid assets have now become a liability for you in this negotiation. These guys just don’t get it you think to yourself. Fine. You give them what they want because you are going to go out and find a better bank to deal with… one that will appreciate your passion and commitment to this once-in-a-lifetime project. The messages you've left with the other banks go unreturned. You've been in this business long enough to know that if they don't call back, they aren't interested. The stock market is half its peak and continues to decline. It's compounded the stress on your cash cushion because you opted to borrow against your securities instead of selling them into a declining market. You are running out of cash very quickly. The threats are real, the demand letters grave. Within a few short months you are back in the lenders conference room. This relationship has seen better days. You stay cool but the knot in your stomach is unrelenting. For the first time in your life you aren't going to be able to pay an interest payment. You learn another new term, "forbearance agreement." After reviewing it, even your own attorney suggests you retain a lawyer from New Bern, the one that requires a $25K retainer, but you don’t heed the advice because you've convinced yourself that you’re invincible. This project has too much potential; you just need to keep pressing forward. You sign the forbearance agreement because you believe that all you need is a little more time to find new cash and an improving economy. Certainly things won’t get worse. You have a rough idea as to the amount of time and money you've put into this project but once you sit down and calculate the actual cash you’ve invested, the cash that you are unlikely to ever see again, the gravity of your situation sets in. Your loss is in the millions (plural). You stop eating. You stop talking to your wife and you stop talking to your kids. You're always tired but no matter how hard you try you can't sleep and if you do fall asleep you can't stay asleep. Nothing feels good and you are so angry with yourself that you get to the point that you really don't care what happens, you just want it to happen. You’re not sick of living, but you’re sick of living like this. It's the spring of 2009. You lock yourself in front of your laptop and generate a manifesto of options for the lender. You create your own workout plan; it reads like a global military operation. You list every available scenario, fifteen in all, and make a recommendation. Who knows this project better than you? You hand deliver your own set of solutions. And then you hold your breath - for a month. Some guy from Richmond and his boss from Orlando fly into town. This time they are in your conference room but it's obvious they still hold the leverage. Your plan has merit, but you need to find a buyer or more equity. You owe the bank a lot of money but it appears you are still better off alive than dead to these guys. For a moment you are grateful. This is the 'time' you needed. With their help you get back to work and finish the site. Within months the marina is filling with boats and the joggers are discovering the RiverWalk. Roads and sidewalks are complete. Instinctively you shift gears back to 'marketing mode' and begin in earnest to generate the pre-sales you need for that first building. Surprisingly you hit your sales target, your buyers are qualified, and their deposits are in the trust account, you carry your loan request to any lender with a pulse but there are no takers. You do this for almost a year. Your world is consumed with managing a project with no income and no signs of life. You're losing momentum, faith and confidence. You're reminded of the much maligned BP Executive’s infamous sound bite; you “just want your old life back." It's the fall of 2010, and you meet the new guy from Raleigh assigned to you by the bank. He's stern, smart and a realist. He's only slightly older than you but his well-honed experience is very specific. Most of his career has been spent on the unattractive “workout” side of the real estate world. Like a seasoned counselor from hospice - he tells you clearly, "Stop fighting. Your demise is inevitable. Your time and money are lost. It's time to get your affairs in order." "No. You don't understand. We are so close, we've come so far. This can't be the end." But it is, and, for the first time in years, you sleep.